I have had horrible skin since I've stopped nursing. So bad in fact that for a split second I wanted to get pregnant again so that it will go away. However my husband vetoed that. I've struggled finding a grocery store cleanser that can do the job. I no longer have any S.D. products and they are too expensive for me to purchase at this time. I need to find something that I can pick up while I'm out running errands and that doesn't cost an arm and a leg. I've tried Neutrogena, and Boots but to no avail. So last week we ran out of astringent and I found this at Target... I forgot all about Noxema products. 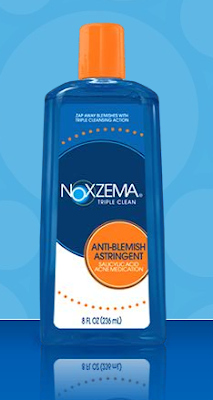 It seems like a lot of my friends in high school used Noxema, but I haven't heard about it in forever. I figured that my skin is acting like it's 16 though so I'll give it a try. Well wouldn't you know it's working! I'm going back for the cleanser tomorrow! I'll have to try it because mine is doing the same thing ever since I stopped nursing (and I'm older than you!). Mine, too. I've gone back to Clinique and that is working so far... we'll see. Get a good scrub too. I think that is key. I've had bad acne my whole life, but it's really cleared up since I started using my BeautiControl products. Their skin care is amazing! I love it!